BED BUGS! They have been dubbed the peskiest pests of 2018. And, actually, this wasn't their first time to win this not-so-prestigious title. They were the most often online searched pest last year, as well. The Pest of the Year title was derived from total internet searches over a calendar year. While bed bugs claimed the title again this past year, the list did see some notable shakeups. Possums overtook scorpions for the number-two spot, and squirrels scuttled their way onto the list for the first time. And the pestiest place? Washington D.C. Bed bugs topped the list of America's most pesky pests for the second year in a row, according to Terminix, a provider of termite and pest control services and a ServiceMaster (NYSE: SERV) company. 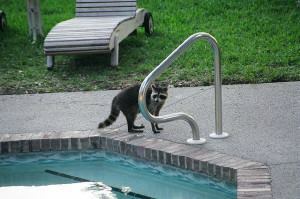 From Flickr user mwms1916Raccoons can, and do, poop in the pool. According to the Entomologirst's Almanac, Washington DC is the pestiest city in the nation. The District of Columbia searched for pests more than any other location, followed by North Carolina and Massachusetts. It wasn’t just the East Coast that had pests top of mind, with states from Washington to Tennessee making the list. If you are a fellow resident of Omaha, NE, you will be happy to know that Nebraska didn't even make the top 10! For more information, click here. If you are thinking of making a move, please give us a call. We won't "pester" you and we'll do our best to find you a pest free home!